This new data is a powerful tool for studying the stellar halo of our galaxy – the outer region of the Milky Way system that consists of a spherical cloud of stars extending beyond the central spiral, into the outer reaches of the Milky Way’s dark matter halo. This halo of stars, and all of the systems it contains, are powerful probes of the local dark matter distribution and contain clues as to the history of the formation and evolution of our Galaxy. Today’s paper considers one particular type of system in the stellar halo – stellar streams. These groups of stars, stretched into arcs across the sky, are the remnants of small galaxies and clusters of stars that have been torn apart as they orbit around the Milky Way. Previous Astrobites have considered how stellar streams are essential tools for studying galaxy formation and the nature of dark matter, and today’s paper illustrates how powerful these streams can be with the help of Gaia. The authors of today’s paper look at one stream in particular, GD-1. This nearby, long stream is on an orbit that makes it ideal for constraining the properties of dark matter in the Milky Way. It also provides an excellent example for how Gaia velocities can enhance our understanding of these exciting systems. So, how do the velocities from Gaia help in the study of stellar streams? 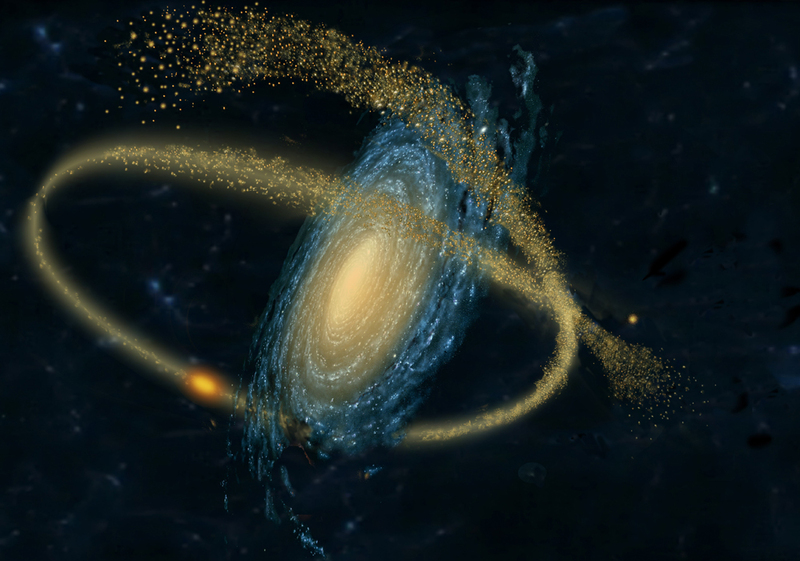 First of all, they help to trace out the path that the stellar streams follow as they orbit around the Milky Way. This improves our understanding of the formation and evolution of the stellar stream, and thereby tightens our constraints on the local distribution of dark matter. Second of all, and perhaps less obviously, they can also help with picking out the stars that belong to these streams, clearing up our view of the systems. These objects are far out in the stellar halo of the galaxy, beyond the extent of the central disk (Figure 2), which means that their velocities are distinct from the coherently rotating disk of the galaxy, so by selecting only a small range of velocities we can throw away many of the contaminating foreground stars. Figure 3 shows this process for the stellar stream GD-1. The right-hand panel of Figure 3 shows velocities along (x-axis) and perpendicular to (y-axis) the length of the stream in the plane of the sky. The little clump of stars highlighted in orange corresponds to the stellar stream and nicely stands out from the larger clump corresponding to all of the other Milky Way stars in the region. As expected, the stream stars aren’t moving much perpendicular to the stream (close to 0 along the y-axis), but are mostly moving along the length of the stream, which traces out their orbit around the galaxy. The left panel shows the positions of the stars selected within the orange box, and the stellar stream clearly stands out! This is already quite impressive, but our view of this stellar stream really opens up when the Gaia astrometry (the measurement of precise positions and velocities) is combined with photometry (the measurement of light) from other experiments! In Figure 4, the authors have matched the Gaia data with data from Pan-STARRS to consider the brightness of these stars as a function of color (right panel). These properties are related to the age and chemical composition of stars, allowing the authors to select out particular stellar populations. The left-hand panel of Figure 4 shows how clearly the stream stands out when these two types of data are used in tandem. Now, what exactly have we gained from this clear view of GD-1? First, this is the most complete view of the stream to date. A large segment of the stream is visible that had previously been hidden among the foreground stars (left of the gray line in Figure 4), extending the length of the stream by 20 degrees across the sky. Second, variations in density along the stream are immediately apparent. Figure 4 points out high density blobs and low density gaps, which potentially indicate very exciting science! The blob of stars may be the progenitor – the original cluster of stars that is gradually being torn apart to form the stream. The location of the progenitor is an essential piece of information for accurately modeling the formation and the orbit of this stellar stream, which can be used to study the large scale distribution of dark matter in our Galaxy. The low density gaps are perhaps even more exciting. As discussed in previous Astrobites, small invisible clumps of dark matter can punch holes through stellar streams, leaving behind gaps. Further work will reveal the nature of these intriguing density features along GD-1, perhaps leading to new insights into the nature of dark matter. This paper illustrates the power of combining Gaia velocities with photometry to study stellar streams, with the excellent example of GD-1. This procedure can also be applied to a variety of systems in the Galactic halo, like dwarf galaxies and globular clusters, to expand our understanding of the Milky Way halo as a whole, ultimately informing theories on the nature of dark matter and the evolution of the Milky Way. This exciting new era of Gaia has only begun. Stay tuned to see what other unexpected science this new view of our Galaxy will reveal. I am a 2nd year grad student at the University of Chicago. I work on combining simulations and observations to learn about the Milky Way and dark matter. 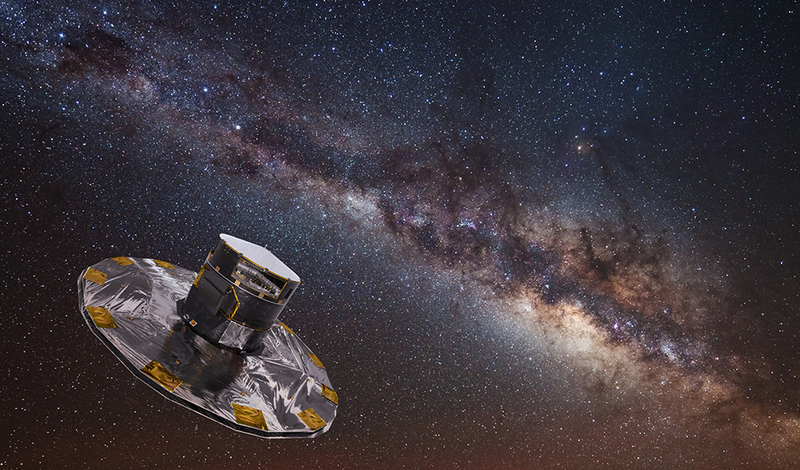 Searching for Evidence of Dark Matter in Stellar Streams No escape from the Milky Way Stellar Streams & The Nature of Dark Matter Do the Milky Way’s Stellar Streams have that Fuzzy (Dark Matter) Feeling?